On the left ,Mr.George Fernandes,Defence Minister of India addressing the International Seminar On the Global Threat of Terror . New Delhi, October 30, 2001: Mr. George Fernandes, Union Minister for Defence, said that the United States had lined up numerous nations to endorse its inevitable fight against terrorism and ironically, Pakistan which harboured, took pride in training terrorists, and mounted terrorist attacks on India for years now, was being projected as the most loyal ally of the U.S. in the global war against terrorism. Mr. Fernandes added, "Perhaps, there is some sort of poetic justice in this turnaround. It was the United States which had collaborated with Pakistan in creating the Taliban militia to fight against the Russians. Pakistan has now become the cat's paw for the United States to destroy the Frankenstein, they jointly fathered," he said. 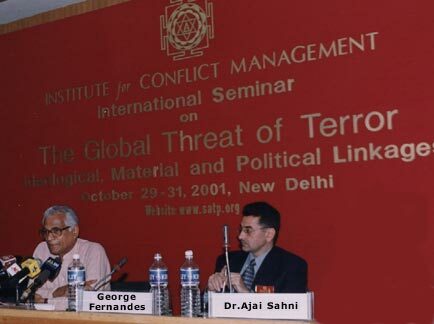 Mr. George Fernandes was speaking at an international seminar on "The Global Threat of Terror: Ideological, Material and Political Linkages" organised by K.P.S. Gill's Institute for Conflict Management. The Institute constitutes a major forum for research, data and analysis on terrorism and low intensity warfare in South Asia. The Seminar was convened at the India Habitat Centre. Mr. Fernandes also pointed out that, Pakistan which had used the Taliban to fulfil its nefarious designs in India, now has to swallow, probably, the most bitter pill in its 54 years of existence. The Defence Minister said that the U.S. objective of capturing Osama bin Laden "dead or alive" may be unfulfilled and the aim of overthrowing Taliban and re-establishing a new regime in Afghanistan is a "long term gamble". Pakistan, he said, emphatically, was the driving force behind every terrorist action on Indian soil in Jammu and Kashmir and the north-east and Punjab earlier. Commenting on the terrorist nexus, Mr. Fernandes said that "the hijacking of Indian Airlines flight 184 from Kathmandu to Kandhar in Afghanistan was a joint exercise in terrorism by the ISI and Taliban". He also added that Pakistan had terrorist linkages in Punjab, Kashmir and the north-east and used them to destabilise India. The Defence Minister stressed that India had avoided attacking the terrorist training camps in Pakistan primarily because it did not want civilian casualties. The Defence Minister said that because of bin Laden, the Taliban regime or Pakistan's exports to India of an unending stream of blood-thirsty terrorists, one should not brand Islam as a doctrine of terrorism and point an accusing finger at Muslims. A terrorist, he said, had no caste, creed or culture. "A terrorist is just a terrorist." If bin Laden was the mastermind of the September 11 terror attacks, there is no reason, according to Mr. Fernandes, to doubt that he did mastermind the assassination of Northern Alliance leader Ahmed Shah Masoud. Tracing out the sequence of events, the Minister said, the timing of the assassination was the proof of such involvement. The Minister pointed out that India had offered its unstinted support to the US in its mission to defeat global terrorism. The US, however, has never supported India in its fight against Pakistan sponsored terrorism. As a result, he said, one should not rule out the necessity of India waging its own war against terrorism on its border after the US action in Afghanistan ended, and the U.S. went back to its five decade old cosy relationship with Pakistan. Commenting on the massacre of 18 Christians in Bahawalpur, Pakistan, Mr. Fernandes quoted the Pakistani President Pervez Musharraf as saying that initial investigations into the attack indicated the involvement of trained terrorist organisations, which wanted to create communal discord. "Was this a confession of guilt or was it a Freudian slip?" Fernandes quipped. Mr. Fernandes concluded that there was a moral to be learnt in the immoralism of the sponsors of terrorism: "If you sup with the terrorist, you will not live to have your breakfast." At the same forum, Mr. K.P.S. Gill stated that India's experience in fighting terrorism in various theatres would be integral to counter-terrorism and conflict resolution responses that are now to be adopted by the whole world. He observed that the issue of terrorism has become critical for the survival of democracies. Mr. Gill added that those who are thinking of a few months' global war against terror are deluding themselves. In the context of Pakistan's support to USA, Mr. Gill was of the opinion that it is a total misreading by the West that Pakistan is a frontline state against terrorism. He added that "it is on the frontline, no doubt. But on the wrong side of the ideological battlelines". Prof. Amin Saikal, Director, Center for Middle Eastern and Central Asian Studies & Professor of Political Science at Australian National University, Canberra, spoke at the Seminar on the subject of "The Taliban: Pakistan's Geopolitical Instrument and America's Problem", said that the current crisis unfolding in Afghanistan could have been avoided had the US heeded the assassinated Northern Alliance leader Ahmed Shah Massoud's earlier warnings that Pakistan was rapidly consolidating a potent geopolitical instrument in Afghanistan to further its regional ambitions. This instrument was being grounded in a dangerous triangular alliance between the Taliban, Osama bin Laden and Pakistan's Inter Services Intelligence (ISI), turning Afghanistan into a major source of instability in world politics. Prof. Saikal indicated that Washington's failure to assist Massoud to limit the menace eventually cost both him and the US dearly. According to Prof. Saikal, the US administration - the CIA in particular - quietly endorsed the emergence of the Taliban regime which evolved in Afghanistan with Pakistan's human, military and logistical support, and with Saudi and United Arab Emirates (UAE) financial backing. Washington, Prof. Saikal said, perceived the Taliban as being beneficial to its interests in terms of the militia's anti-Iranian character, and its purported ability to secure a direct corridor through Afghanistan into the newly independent but resource-rich former Soviet Central Asian Muslim republics. Prof. Saikal, while indicating that the US did not oppose bin Laden's move into Afghanistan in 1996, added that they were distinctly aware of his presence as he had fought against the Soviets under the tutelage of the CIA and ISI. In his view, the US deliberately ignored reports about an ISI-driven Taliban training of Arab and Kashmiri militants to fight US hegemony in the Muslim world and India in Jammu and Kashmir. It also failed to provide the Massoud-led Northern Alliance with the necessary help to combat a complete Pakistani-Taliban-bin Laden take-over of Afghanistan. On cross-border terrorism, Prof. Saikal observed that since the ISI had been operating Pakistan's Afghanistan and Kashmir policies since the early 1980s, "it was now clear that the ISI had established close links between various client forces for a wider, multi-faceted regional network of armed activists." With reference to strategies, Prof. Saikal opined that US has failed to see that bin Laden and his Al Qaeda network were closely intertwined with the Taliban and the ISI, that Laden virtually "owned the Taliban by providing the militia with millions of dollars and thousands of Arab fighters, and that there was little chance of taking out bin Laden and his al-Qaeda lieutenants without at the same time taking on the Taliban and the ISI." Dr. Rohan Gunaratna, Senior Research Associate at the University of St. Andrews, Scotland, asserted that it is a disgrace on the part of India and Sri Lanka that the LTTE Chief Prabhakaran was still evading arrest or neutralisation. He added that both the countries should team up to engage and defeat him. Commenting on bin Laden's Al Qaeda, he said that it has the capacity to infiltrate any Muslim community in the world. Dr. Gunaratna also added that since the penultimate leadership is significant, the Al Qaeda would continue to remain operational even if bin Laden is captured or killed. Dr. Evgueny Kozhokin, Director, Russia's Institute for Strategic Studies, Moscow, in his presentation, said that Central Asia handles 65 per cent of all narcotics coming out of Afghanistan. Commenting in the context of CIS territory, he indicated that terror is used finally as a mean to achieve political goals of establishing new state formations or changing of political regimes. On the concluding day of the seminar on October 30, 2001, three research papers would be presented between 09:45 and 15:00. K.P.S.  Gill will also present an assessment of current developments in counter-terrorist policy and practices at 15:00 on October 31, 2001. The Valedictory Address of the International Seminar will be delivered at 16:00 on the same day by Mr. Arun Shourie, Minister for Disinvestment and the Department of Development of the North East Region.